It occurred to me when I was young, my mom always asked me to stop crying whenever I cried. Now that I am a dad myself, it’s only natural that I follow my mother’s footsteps. But I realize there’s something wrong to ask a child who is genuinely sad to stop crying. Men don’t cry mentality is a misconception. We should throw it out of the window. Crying won’t make men a sissy. Rather it makes you stronger. If you have cried before as I did on a few occasions, you know the “high” feeling that comes after a good cry. Not to mention the feeling of relief. Hard to describe but it’s such a great feeling! Now let’s talk about crying children. When your child cries, do you allow him to express the inner feelings or do you suppress them by asking your child to stop crying? Here are some pointers you might want to try. Let your child cry to his heart’s content. I urge you NOT to ask your child to stop crying. You already know the healing power of crying. Silence is gold. And this is the time. Just keep quiet and if your child feels like letting it out, let him be. Don’t judge, don’t lecture (this is not the time), don’t scold, and don’t threaten. Also don’t even think of hitting your child to make him stop crying, it will make it worse! Listen attentively. Just be there for your child, listen to what he has to tell you. Encourage him to express his feelings. Give support. If possible, give your child a hug or find a way to soothe him. I always do that by patting the child’s back mildly. Everything will be fine once he finishes crying. How do I know? Of course I do. Just last week, it happened to my preschool daughter, J.
J refused to go to kindergarten last Friday. This was very strange as she loves kindergarten like crazy and kindergarten is her second home. Upon asking, she revealed that she didn’t like the Mandarin class. After a few rounds of Q&A, it’s not the class that she didn’t like. It was the noise created by her classmates that irritated her. Just because of this, she’d rather skip other classes altogether. My wife and I assured her we could work out something. We could tell that J was really sad. At that moment, she really didn’t care what the solution was. All she knew was she didn’t like attending Mandarin class. We knew that was not the time to lecture. She burst out crying. Tears flowing freely on the cheeks. If you were there, you could tell she was truly disturbed and sad. Poor girl. I acknowledged her feelings and let her cry without interruption, as long as she wanted. She cried for a few minutes. And then, as expected, she was back to normal. She didn’t say anything but nodded her head… with a shy smile. You don’t want your child to cover up his feelings. But if you discourage him from crying and sharing openly his feelings, you’re teaching your child to be “hard on the outside, soft on the inside” person. 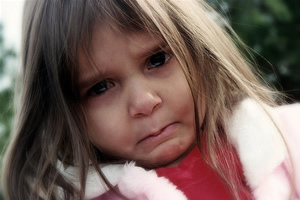 Letting your child cry it out is important as crying is an emotional outlet for kids (as well as adults) to let go of their grief and sadness. This is important as your child will most likely to grow into an emotionally healthy adult.